Call me an April fool. I thought that the pure joy of comic book collecting was going the way of the Dodo bird but judging from the attendance of yesterday’s Capital Comic Book Convention I’m glad to say I am mistaken. No celebrities. No cosplay. No special events. Just a room full of vendors who also love the hobby and collectors looking for unique and fun comics. I want to thank my partner Chris for all his hard work. He made Jee-Riz’s booth a standout in the room. “You don’t see this sort of stuff very often” was heard more than once. 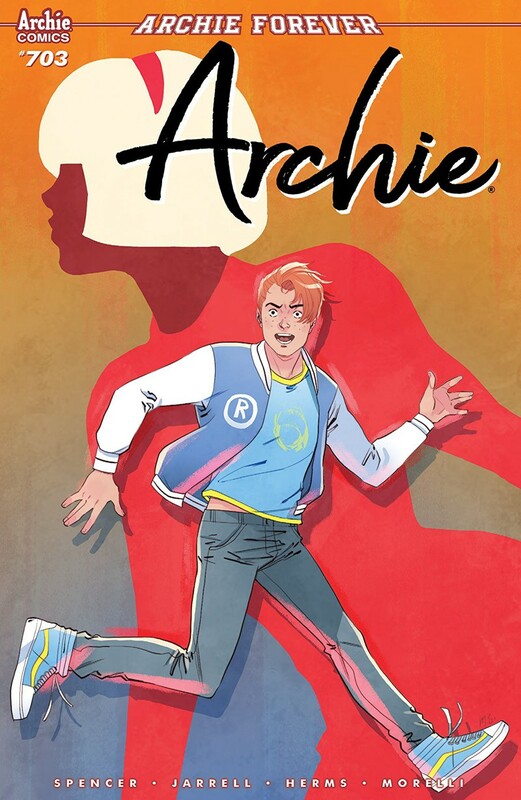 Archie #703 – Nick Spencer (writer) Sandy Jarrell (artist) Matt Herms (colours) Jack Morelli (letters). So much going on. We find out who attacks Jughead in the woods and why. I want to be a roadie for Josey and the Pussycats. Betty and Veronica enlists the aid of Cheryl Blossom to ferret out if Archie has a new girlfriend. As long as it’s not Betty I’m not jealous of the ginger bonehead. Avengers #17/LGY #707 – Jason Aaron (writer) David Marquez (art) Erick Arciniega (colours) VC’s Clayton Cowles (letters). This issue has some of the cheesiest dialogue I have ever read. I really hope that the Vampire War is over. This Avengers team is a bit too goody two shoes for me. Batman #67 – Tom King (writer) Lee Weeks & Jorge Fornes (art) Lovern Kindzierski (colours) Clayton Cowles (letters). Knightmares part 5. Batman’s in his Batman: Year One costume chasing a masked killer. You’ll feel like you’re watching a Roadrunner cartoon. The guy in the mask is William Ernest Coyote. You’re in for a shock when Batman unmasks him. Savage Sword of Conan #3 – Gerry Duggan (writer) Ron Garney (art) Richard Isanove (colours) VC’s Travis Lanham (letters). Conan is captured by the evil wizard Koga Thun but manages to escape to continue his search for treasure. It looks like he’s got to fight zombies to get to the treasure. 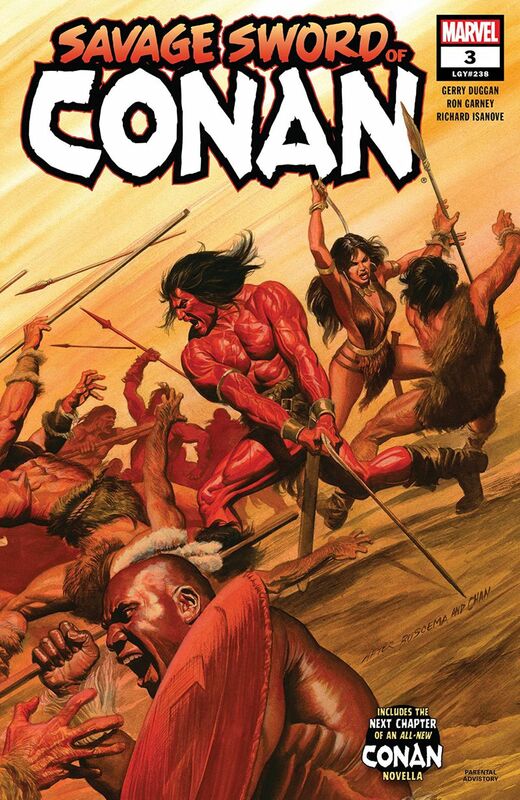 I got all excited when I saw the cover showing Conan fighting alongside Belit but nothing like that happens at all inside. I’m not reading any more of these. I don’t like being played for a sucker. Immortal Hulk #15 – Al Ewing (writer) Joe Bennett (pencils) Ruy Jose (inks) Paul Mounts (colours) VC’s Cory Petit (letters). 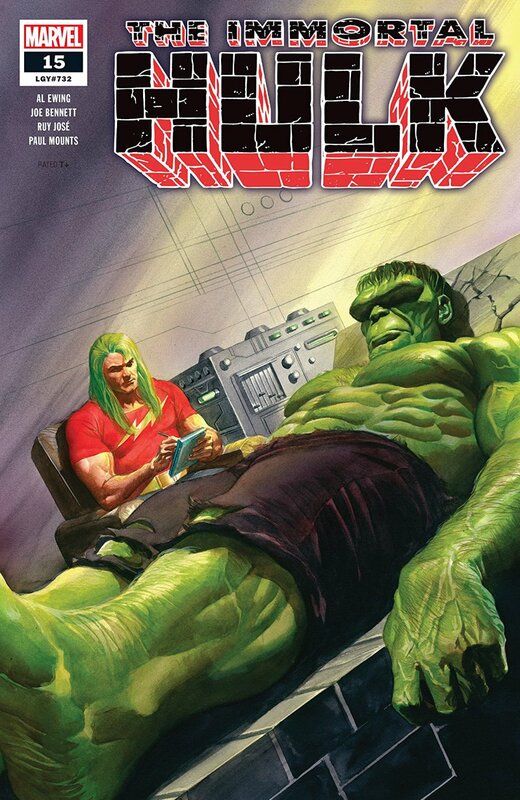 I love this couch session with Doc Samson and the Hulk, sans couch. The two talk it out after a sniper shoots Betty and the Hulk. Some of the stuff they talk about is quite insightful. You think they’re trying to find Betty but they’re not. Their final destination is a surprise. 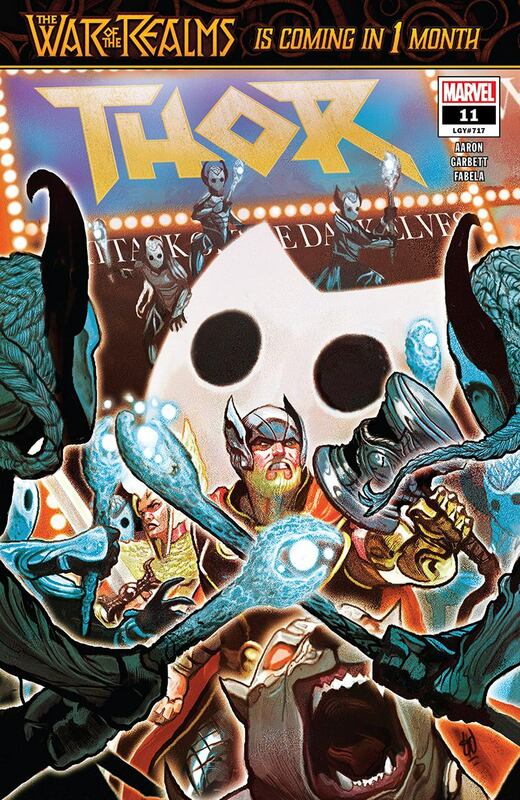 Thor #11 – Jason Aaron (writer) Lee Garbett (art) Antonio Fabela (colours) VC’s Joe Sabino (letters). Thor goes looking for his best friend thinking he’s going to need all the help he can get in the coming War of the Realms. The Lady Freyja has to make her son stop his foolish search. I like the little snippets showing characters we haven’t seen in a while and I can’t wait to see what their roles are in the war. Get ready true believers, Malekith is about to invade Midgard. 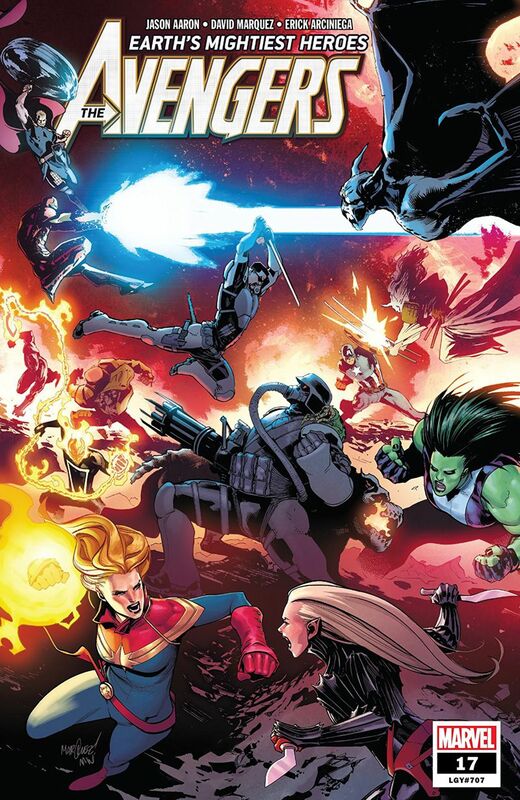 Avengers LGY #714: No Road Home #7 – Jim Zub, Mark Waid & Al Ewing (writers) Paco Medina (art) Jesus Aburtov (colours) VC’s Joe Sabino (letters). This issue features Monica Rambeau/Spectrum. Who better to fight the Queen of Darkness than a being of light. The last page made up for the disappointment I felt reading Savage Sword of Conan #3. 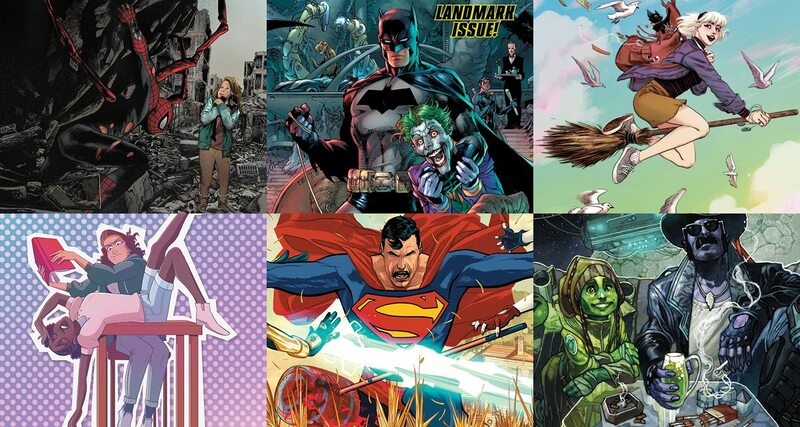 Heroes in Crisis #7 – Tom King (writer) Clay Mann (art pages 1-6, 11, 17,-19, 23-24) Travis Moore (art pages 8-10, 13, 14-16, 20-21) Jorge Fornes (art pages 7, 12, 22) Tomeu Morey (colours) Clayton Cowles (letters). You could read this one issue and it wouldn’t make a lick of sense unless you’ve read the previous 6. I even had a hard time understanding what’s going on and I’ve read every issue. I think the only reason I’m going to read the last two issues is to find out if anything makes sense in the end. 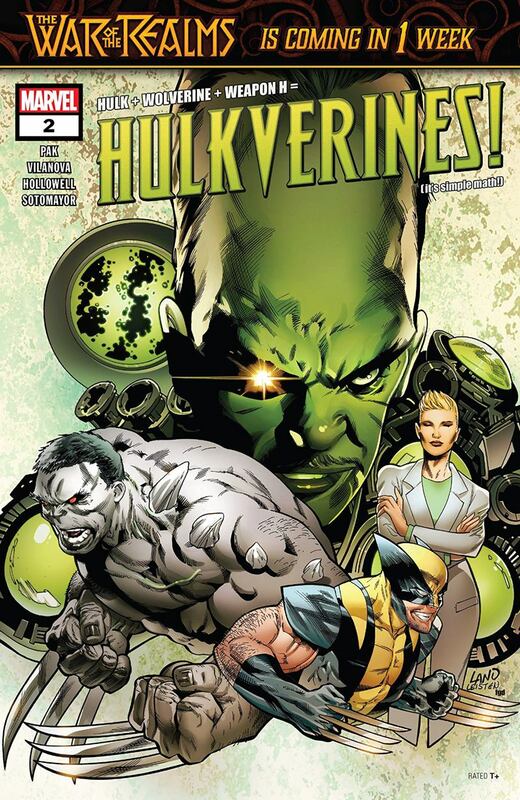 Hulkverines #2 – Greg Pak (writer) Guiu Vilanova (art) Morry Hollowell with Chris Sotomayor (colours) VC’s Joe Caramagna (letters). We go from Hulkverine, the Hulk and Wolverine fighting each other to the three of them teaming up. Meanwhile the Leader and Doctor Alba, who created Hulkverine, do the super villain equivalent of what the three super heroes did. The result is going to be very interesting. This is the first I’ve seen of Guiu Vilanova’s art and I think it’s great. 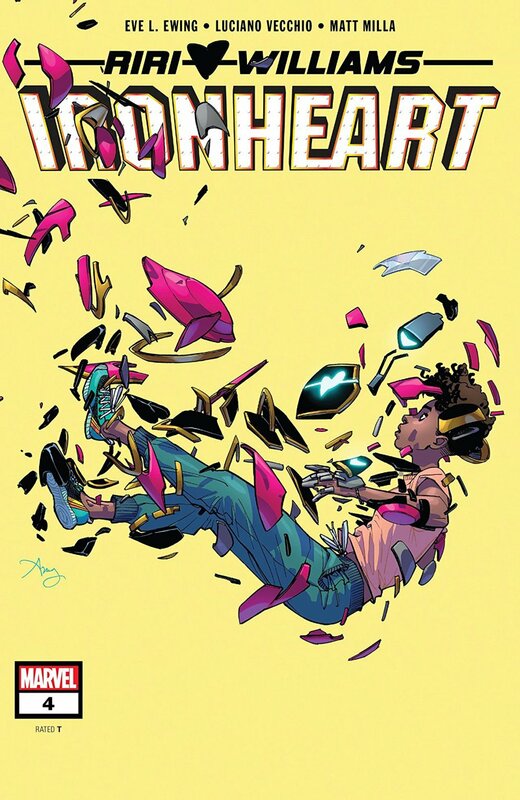 Ironheart #4 – Eve L. Ewing (writer) Luciano Vecchio (art) Geoffo (layouts) Matt Milla (colours) VC’s Clayton Cowles (letters). It’s a rematch with Midnight’s Fire. This new super villain reminds me of Miles’s uncle Aaron AKA the Prowler. I hope there isn’t too much overlap between these two young super heroes, otherwise I will get bored with one of them. 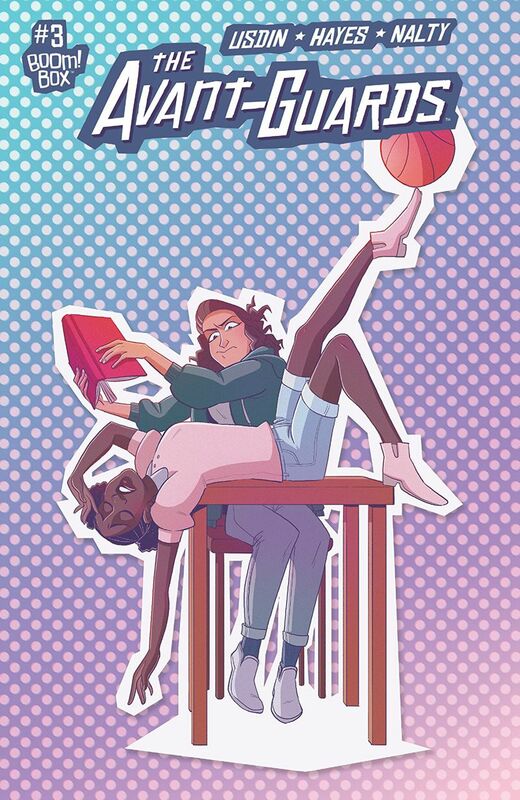 The Avant-Guards #3 – Carly Usdin (writer) Noah Hayes (art) Rebecca Nalty (colours) Ed Dukeshire (letters). The team has their first practice and play their first game. Major points to Noah for showing the players following through on their shots. I used to love playing basketball but never made my high school team. So I ended up managing both junior and senior teams and got to practice with them. I would love to find someone my own age to shoot some hoops with right now. 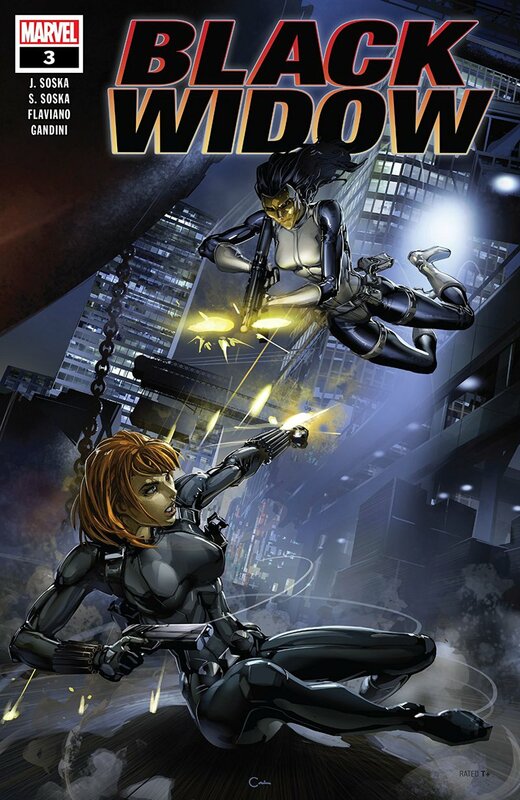 Black Widow #3 – Jen & Sylvia Soska (writers) Flaviano (art) Veronica Gandini (colours) VC’s Joe Caramagna (letters). Natasha’s mission to shut down an online pay-per-view torture site goes horribly wrong. I can’t wait to see how she gets out of this predicament. 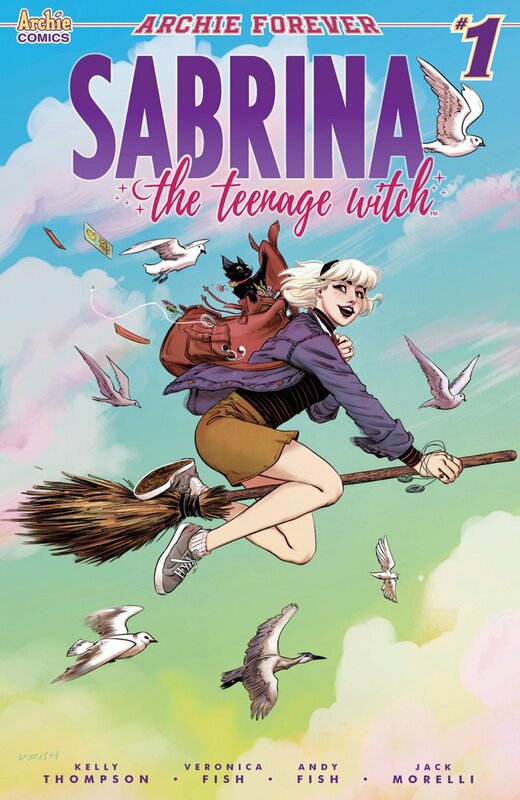 Sabrina the Teenage Witch #1 – Kelly Thompson (writer) Veronica Fish & Andy Fish (art) Jack Morelli (letters). This new comic book is more like the TV show than the gritty ghoulish title that was on the racks a while ago. I liked the old show but haven’t seen the new one. I had a crush on Melissa Joan Hart. I really like the writing and art in this so it’s going on my “must read” list. 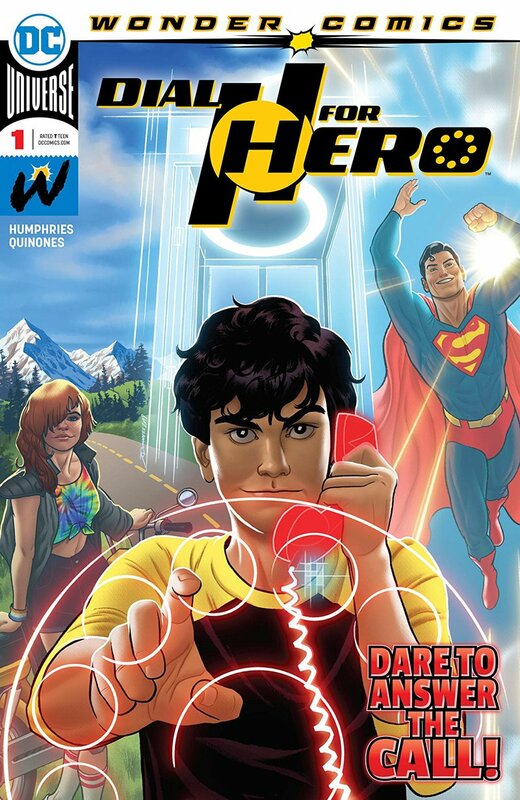 Dial H for Hero #1 – Sam Humphries (writer) Joe Quinones (art) Dave Sharpe (letters). I mainly bought Marvel comics when I got more spending money and could afford new comic books but I did buy this DC title because I liked the concept. Robby Reed was this nerdy kid who finds a rotary telephone dial that changed him into a different super hero whenever he dialled H-E-R-O. he always had different powers and a different costume. This updated version has a kid named Miguel who is an adrenaline junky. An old timey telephone, the whole thing with handset this time, appears before him as he’s plummeting towards certain death and he changes into Monster Truck. The Monster Truck pages are quite Kirbyesque. Throw in a page with Damian/ Robin, Lobo, Snapper Carr, Angel and the Ape, Harley Quinn and Alfred and I am hooked. I liked the town troublemaker Summer too. I am looking forward to seeing their further adventures. Doctor Strange #12 – Mark Waid (writer) Barry Kitson (pencils) Scott Koblish (inks) Brian Reber (colours) VC’s Cory Petit (letters). Herald Supreme part 1. Stephen Strange is bored but he won’t be for long. 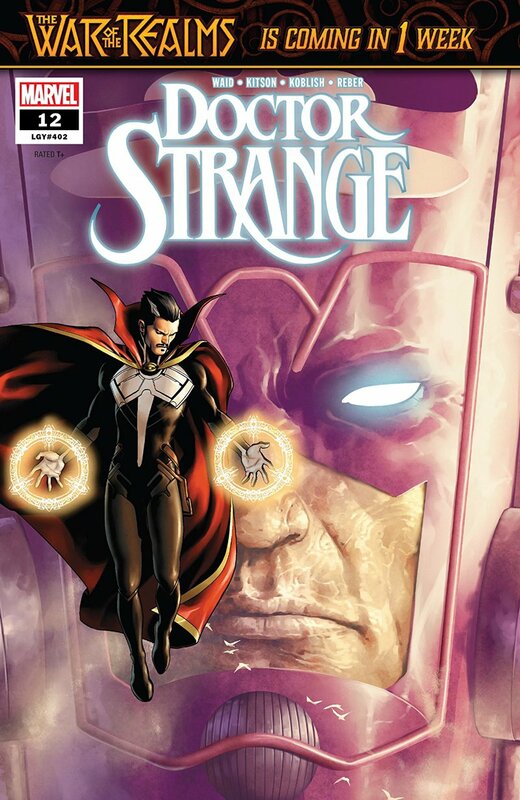 An alien from a warrior race of mystics comes to Earth to ask Doctor Strange how he defeated Galactus. I guess there’s no Marvel comics where this guy is from. Seems the world eater is fixing to eat his planet. The super aggressive Zoloz manages to steal all of Doc Strange’s mystical power and banishes Galactus in the Mystic Realms. Read this issue to find out why that’s a bad idea. Now it’s up to Stephen to keep the big purple planet eater from feeding and destroying our universe too. 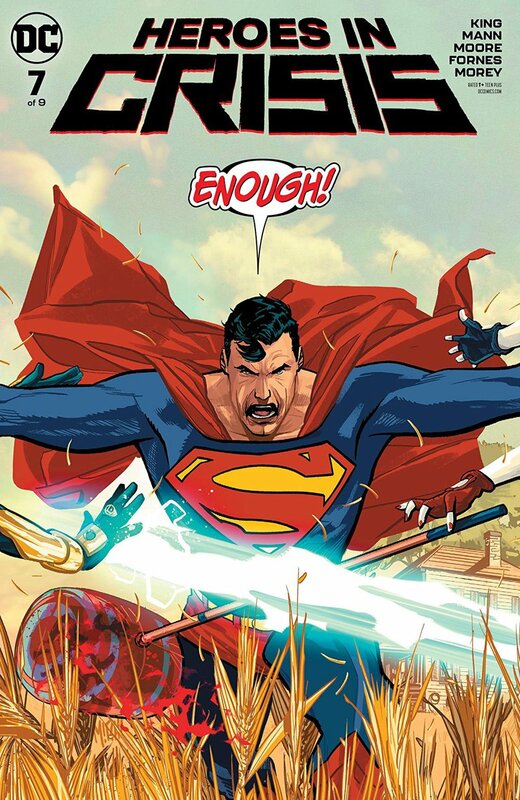 Action Comics #1009 – Brian Michael Bendis (writer) Steve Epting (art) Brad Anderson (colours) Rob Leigh (letters). Leviathan Rising part 3. 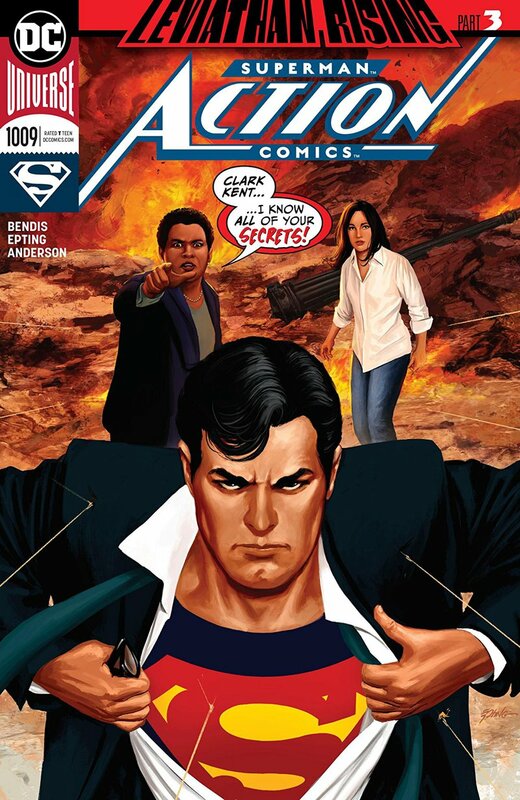 Lois is pissed at Amanda Waller but she reigns in her anger to come up with a plan to find out what Leviathan is. We get to see what Gold Kryptonite does, which is kind of cool. It’s fun when something new gets added to a story. Superman’s transformation surprised me. 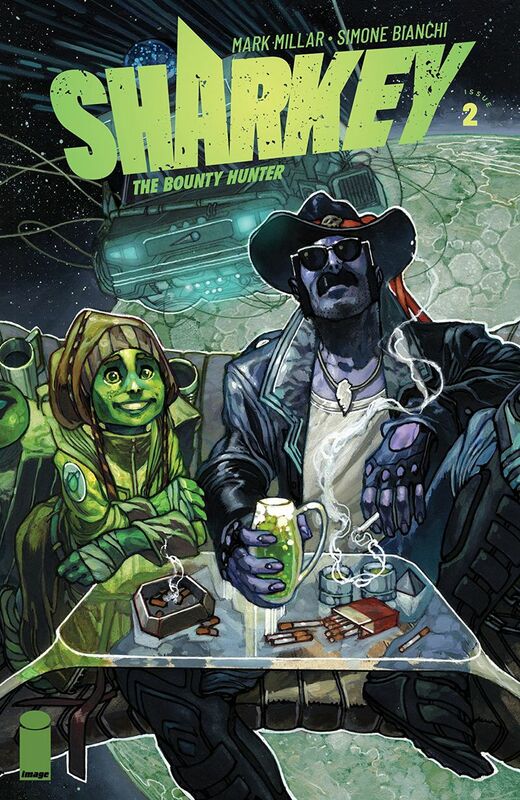 Sharkey The Bounty Hunter #2 – Mark Millar (writer) Simone Bianchi (art & colours) Peter Doherty (letters). This one’s a fun space romp. The hunter finds his prey but she’s not going to come along quietly. 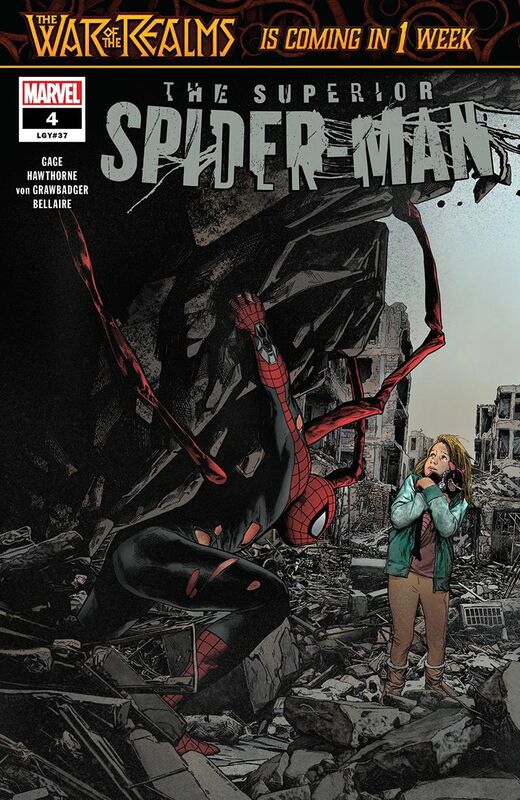 The Superior Spider-Man #4 – Christos Gage (writer) Mike Hawthorne (pencils) Wade von Grawbadger (inks) Jordie Bellaire (colours) VC’s Clayton Cowles (letters). I hope this change is permanent but it’s going to take some getting used to calling Otto but his new identity Elliot. I like how Anna Maria is the woman behind the man. She teaches him a lesson in humility in this issue. Now I have a craving for Polish sausage. Shazam! 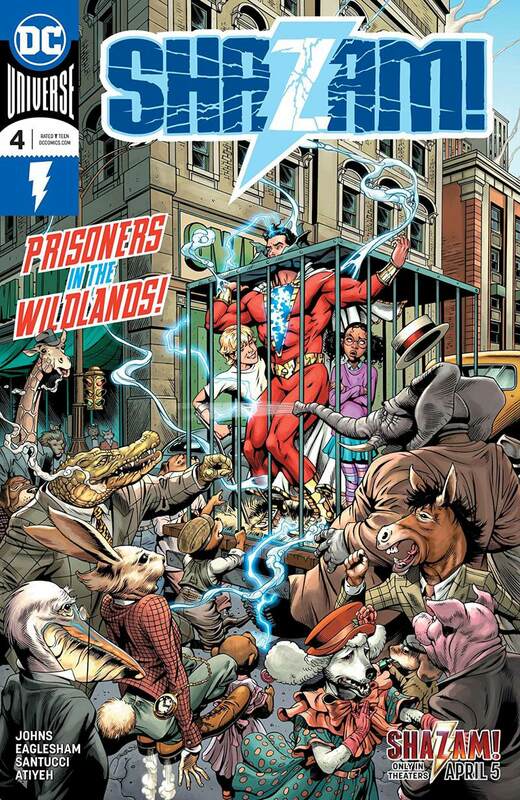 #4 – Geoff Johns (writer) Dale Eaglesham & Marco Santucci (art) Mike Atiyeh (colours) Rob Leigh (letters). Yay, my wish came true. We meet Tawky Tawny the tiger in the first 6 pages. This version is quite dapper. The kids get separated with two in the Wildlands, two in the Gamelands and Mary and Billy in the Funlands, contrary to what the cover shows. Who’s going to rescue the Marvel Family? The last page will enlighten you. I’m not excited about the movie hitting theatres on April 5 but if it’s as good as this comic book, I might go see it. Fantastic Four #8 – Dan Slott (writer) Aaron Kuder, Stefano Caselli, David Marquez & Reilly Brown (art) Matt Yackey (colours) VC’s Joe Caramagna (letters). 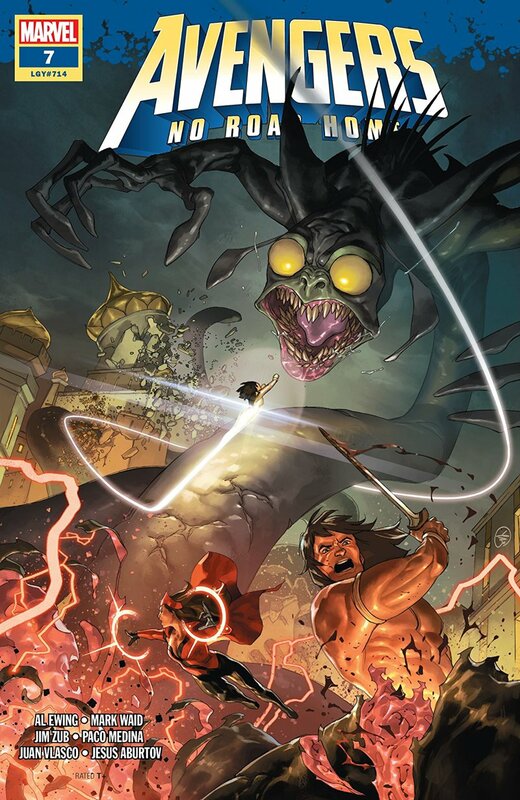 Did someone forget to tell cover artist Esad Ribic that Victorious was female? 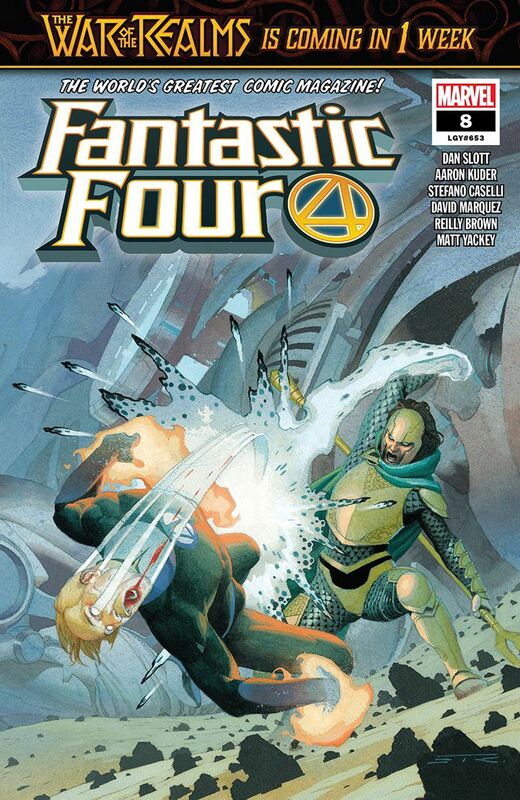 Doctor Doom has captured both Galactus and the Fantastic Four. He’s siphoning off the former’s cosmic power and is going to execute the latter. Reed, Sue, Ben and Johnny are sure in a pickle. I can’t wait to see how they get out of it. 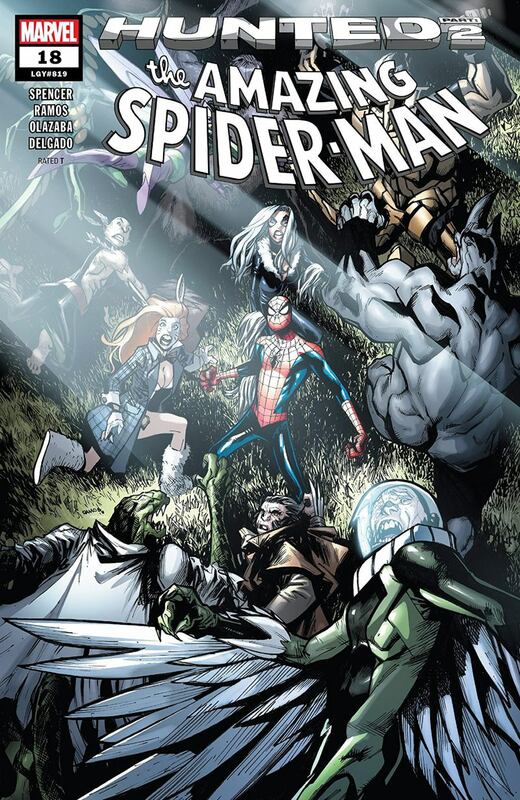 The Amazing Spider-Man #18 – Nick Spencer (writer) Humberto Ramos (pencils) Victor Olazaba (inks) Edgar Delgado & Erick Arciniega (colours) VC’s Joe Caramagna (letters). Hunted part 2. There’s a spectre of danger hovering over Mary Jane in the side story. That’s always a good plot twist to keep a Spider-Man fan hooked. Daredevil #3 – Chip Zdarsky (writer) Marco Checchetto (art) Sunny Gho (colours) VC’s Clayton Cowles (letters). Know Fear part 3. Daredevil’s been shot and is about to be arrested for murder. Detective Cole North aims to bring the suspect in no matter what it takes. I wonder if Canadian Chip Zdarsky picked that name as an inside joke? 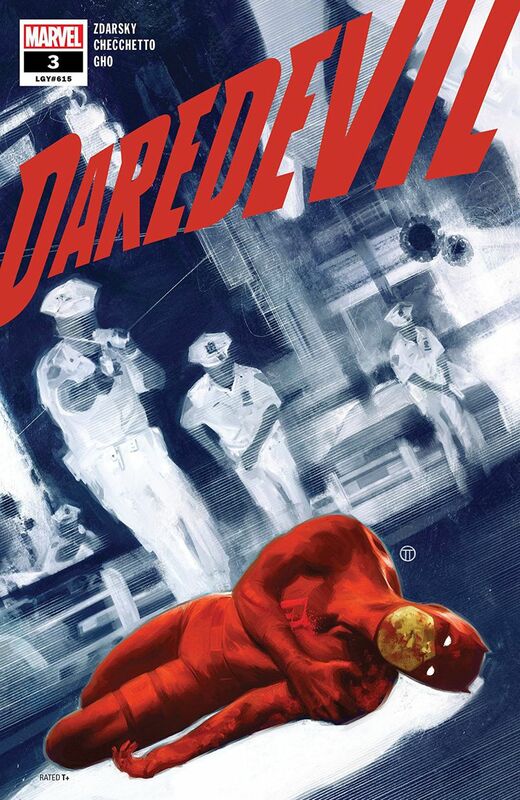 Just when the “tough-as-nails” ex-Chicago cop is about to succeed, Daredevil is rescued. I chuckled when I saw who it was, and it’s not Man-Thing. 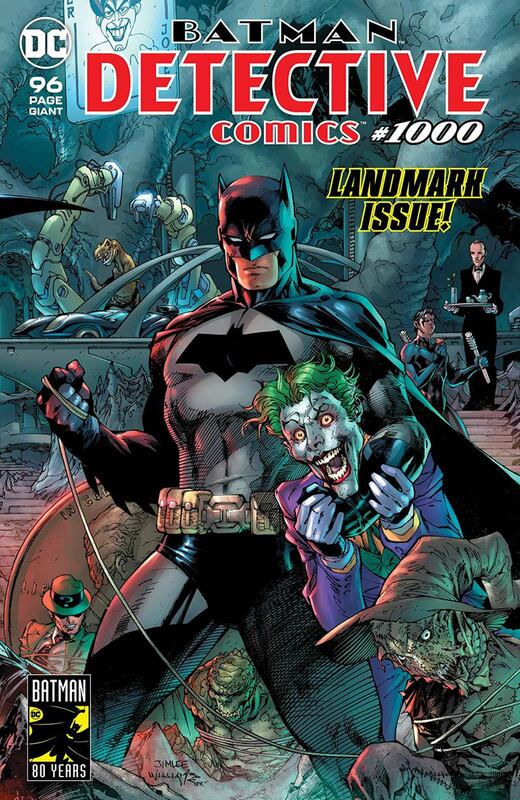 Detective Comics #1000 – Is this worth $9.99 US? You bet your sweet bippy it is. I might even buy one for myself, but which cover to pick? Here are the choices. Then there’s all the terrific stories inside that not only shows Batman as a crime fighter but more importantly for this title as a consummate crime solver. You will find all of Batman’s family and rogues gallery in here. I loved how this issue was a feast for the eyes too. I’m just going to list the titles of the stories and their creative teams. If you don’t buy a copy for your comic book collection then you’re missing out on what will be a classic. With a line up like this you can’t lose. Longest Case by Scott Snyder (writer) Greg Capullo (pencils) Jonathan Glapion (inks) FCO Plascencia (colours) & Tom Napolitano (letters). Manufacture for Use by Kevin Smith (writer) Jim Lee (pencils) Scott Williams (inks) & Alex Sinclair (colours) & Todd Klein (letters). The Legend of Knute Brody by Paul Dini (writer) Dustin Nguyen (pencils) Derek Fridolfs (inks) John Kalisz (colours) & Steve Wands (letters). 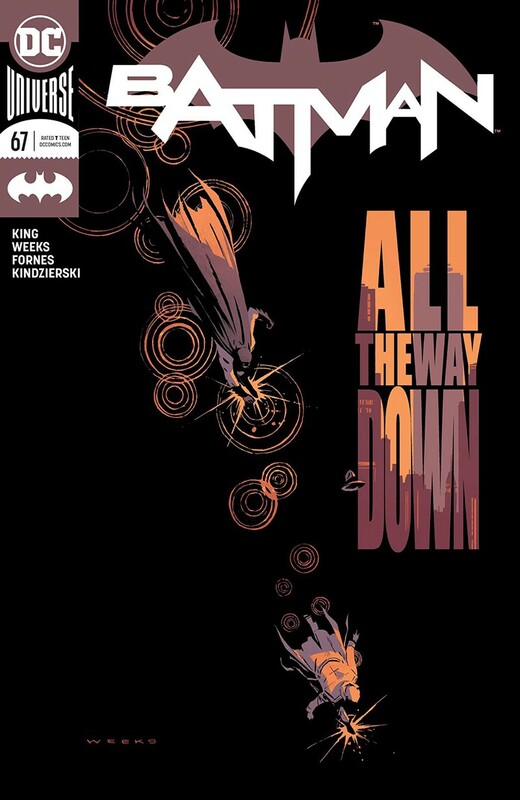 The Batman’s Design by Warren Ellis (writer) Becky Cloonan (art) Jordie Bellaire (colours) & Simon Bowland (letters). Return to Crime Alley by Denny O’Neil (writer) Steve Epting (art) Elizabeth Breitweiser (colours) & AndWorld Design (letters). Heretic by Christopher Priest (writer) Neal Adams (art) Dave Stewart (colours) & Willie Schubert (letters). I Know by Brian Michael Bendis (writer) Alex Maleev (art & colours) & Josh Reed (letters). The Last Crime in Gotham by Geoff Johns (writer) Kelley Jones (art) Michelle Madsen (colours) Rob Leigh (letters). The Precedent by James Tynion IV (writer) Alvaro Martinez-Bueno (pencils) Raul Fernandez (inks) Brad Anderson (colours) & Sal Cipriano (letters). Batman’s Greatest Case by Tom King (writer) Tony S. Daniel & Joelle Jones (art) Tomeu Morey (colours) & Clayton Cowles (letters). And finally Medieval by Peter J. Tomasi (writer) Doug Mahnke (pencils) Jaime Mendoza & Doug Mahnke (inks) David Baron (colours) & Rob Leigh (letters). That last story introduces a new (at least to me) Gotham City crime fighter named the Arkham Knight. His story continues in Detective Comics #1001 and I’m going to snag that issue off the racks to find out who he is.